(Leah Hogsten | Tribune file photo) Ted Neff of South Jordan waits for voting results for the party secretary at the Salt Lake Republican Party organizing convention, April 13, 2019, at Cottonwood High School. Davis County Republicans held their organizing convention the same day. Davis County Republicans over the weekend picked a group of self-described bridge builders to represent them on the party’s state central committee — candidates who say they value party unity, ending meetings on time and keeping the Utah GOP out of debt. 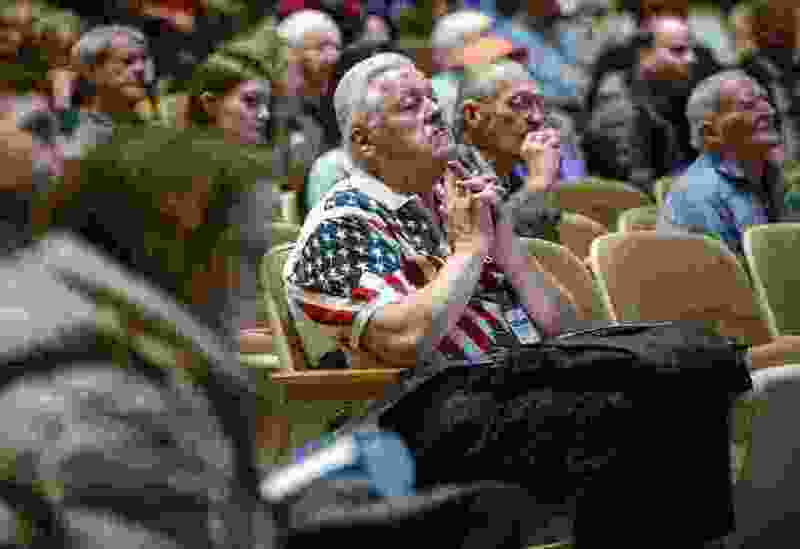 At the same time, the county’s delegates passed a resolution to continue a struggle that some say has chewed through the party’s time and money and been at the root of its internal strife. They acknowledge it’s something of a mixed message; in the Davis County GOP, which has been a microcosm for the discord afflicting the state party in recent years, opinions are still divided on the 2014 state election law that allows candidates to gather signatures to qualify for the ballot. “The delegates do really see things different ways,” said Rep. Ray Ward, a Bountiful Republican who helped rally the “Republicans Building Bridges” slate. The 11-person slate met with success during last weekend’s Davis County convention, landing eight of the 14 state central committee posts that were up for grabs. The remaining six went mostly to incumbent committee members who have dug in their heels over SB54, the law that enabled candidates to secure spots on the ballot by gathering signatures and/or through the traditional caucus-convention system. Last year, Ward had to contend with fallout from the Davis County hardliners’ visceral reaction against SB54. The county party adopted a punitive rule for signature-gathering candidates, requiring them to capture 70% of the convention vote to clinch the party nomination compared with 60% for convention-only candidates. The rule came into play when Ward, a moderate Republican who gathered signatures, captured a 66% convention win over Phill Wright, former state Republican vice chairman, but still had to face him in the primary. Ward said he accepts there are conflicting viewpoints on signature gathering, but he believes opponents of the process have had an outsized influence in party politics over the past couple years. One of those hardliners, Don Guymon, said he does remain dedicated to overturning SB54 five years after the law’s passage. But he says he and his allies — pejoratively known as the “Gang of 51” — have been unfairly depicted as rabble-rousers and argues the state party drama is really coming from elsewhere. Before this year’s convention, someone circulated fliers taking aim at him and other Davis County Republicans who supported the state party’s legal battle to reverse SB54. He’s not sure who printed these attack pieces, but he said his own literature was forward-looking and strictly focused on the positive. "I think it's a convenient excuse to blame the lack of civility on the Gang of 51, when in reality, I think it's the people who had power and are trying to get it back," he said. The most realistic way of restoring the dominance of the caucus-convention system, Guymon said, would be to overturn it in the Legislature. That’s an opinion shared by other members of the so-called Gang of 51, including Helen Watts, another Davis County Republican reelected to the state central committee on Saturday. That doesn’t mean party members sit on their hands — while they are lobbying the state to do away with the signature path, “let’s make it as attractive as possible to go through the caucus system,” she said. But Kara Toone, a member of “Republicans Building Bridges,” said polling has shown Utah voters support SB54, making it tough for lawmakers to topple the law. Toone said the state central committee members chosen from Davis County generally seem ready to lay down the sword and end party infighting, regardless of their opinion on signature gathering. "All of these new people that I've talked to are not anti-caucus system; they're anti-fighting. I'm hopeful that we can figure out where we have common goals and then actually work together like adults and come to solutions," she said. Over the weekend, Salt Lake County’s GOP also elected a number of sitting lawmakers and other moderate candidates to the state central committee. And even the financier behind the anti-SB54 lawsuit — which fizzled earlier this year when the Supreme Court declined to hear the case — says he’s ready to turn attention to other issues inside the party. Dave Bateman, CEO of the Lehi-based Entrata software company, who took over the party’s legal costs, is running for the state central committee in Utah County in the hopes of helping the state GOP with fundraising. He supports continuing to encourage lawmakers to scrap the signature path but believes the legal fights have run their course. “I feel like now’s a good time to find commonality,” said Bateman, who will be up for election later this month at Utah County’s GOP organizing convention. He says the conflict within the state party has been misrepresented in the media — the state central committee itself has been largely on the same page but at odds with the party chairman, Rob Anderson, who is not seeking reelection. Wright, a GOP hardliner who like Anderson hails from Davis County, is one of four candidates running to become party chairman. Wright is employed by Bateman.